Much used words in the koi industry. After a koi is born and had 1 summer season of grown it is then sold as tosai or kept by the breeder to grow a second season and is then sold as a two year old koi named a nissai. A koi that has been with the breeder for three years is called a Sansai. It will be obvious that the breeders keep the best tosai to sell for a higher price after a second growing season. 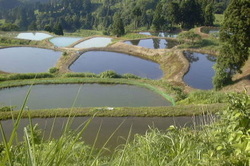 Mud ponds, these are the koi ponds in which they are grown in the summer.